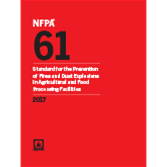 The 2017 edition of NFPA 61 helps you implement appropriate dust control measures and improve safety. In agricultural and food processing facilities, dust control is particularly important to safeguard lives, property, and commodities from potentially deadly and highly destructive fire and explosion hazards. NFPA 61: Standard for the Prevention of Fires and Dust Explosions in Agricultural and Food Processing Facilities governs facilities that handle bulk agricultural materials, their by-products, and other combustible dusts with requirements for facility construction, ventilation and venting, heat transfer operations, dust control measures, equipment design and installation, explosion prevention and protection, pneumatic conveying, and building fire prevention. NFPA 61 is a critical resource for facility owner/operators, safety and health consultants, and enforcers responsible for protection of lives and property in bulk agricultural processing facilities; animal feed production facilities; starch manufacturing facilities; and food production facilities such as bakeries, cereal manufacturing facilities, snack food production, and candy manufacturing. Interested in other editions of NFPA 61? Use the drop down menu above to select the edition year you need. 5.2 Screening for Combustibility or Explosibility. 5.4 Combustibility and Explosibility Tests. 6.2 Risk Component and Acceptability. 9.3 Operating Procedures and Practices. 9.4 Inspection, Testing, and Maintenance. 9.5 Training and Hazard Awareness. 9.7 Emergency Planning and Response. 9.13 Storage of Oils, Flammable Liquids, and Liquefied Petroleum Gas (LP-Gas). 9.15 Miscellaneous Storage in Grain-Handling Facilities.